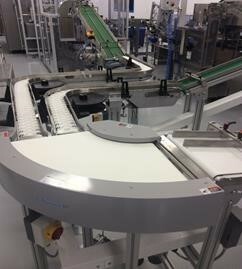 LVP Conveyor Systems have recently built a knife edge conveyor cell with a 90 degree curve conveyor for transportation of small fine packages for the pharmaceutical industry. The spec was as follows.Adaptability of products is a key cost saver for any business. In the production business, it is key for material throughput and profit yield. Less spent means more made, and automation machinery are a fundamental part of your process. If you can adapt the same machine to multiple process and lines, your flexibility is endless and spending reduced. LVP’S Belcon mini conveyors can now achieve between 1-80 m/min using Oriental Motor Brushless DC Motors. coupling this speed range with 8 points of I/O on the BLE2 series, the Belcon mini can achieve may more process functions than any other competitors. As the Irish and UK distributors for the Okura conveyor brands, we are delighted to be able to offer you end to end solutions to your current supply challenges.ciality in LVP Conveyor Systems limited. Get in touch to discuss any projects you have. I would like to ensure you are not missing out on our complete range of products to provide economic materials handling and automation solutions. Looking forward to hearing from you. Provide a transport conveyor line to convey blister packs from the blister outfeed machine to the Flow wrapper. 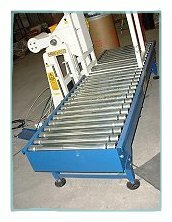 LVP Conveyor Systems Ltd. specializes in supplying, installing and maintaining a comprehensive range of conveyors. Their most recent challenge came from Chanelle Pharmaceuticals in Galway who produce tablets for other major companies. Optimising the use of space as well increasing production line efficiencies is a major factor in the production area. Chanelle required a conveying system to transport small cartons of tablets from the automatic packing machine to the end of line packing area. A process which undoubtedly would speed up the process. Space was an issue and obtaining maximum floor space was paramount. Chanelle PharmaceuticalsLVP Conveyor Systems Ltd. delivered the solution from their superb Belcon mini range. An Aluminum Belt Conveyor was installed and included a small radius bend (200mm inside radius) was incorporated to address the floor space issue. 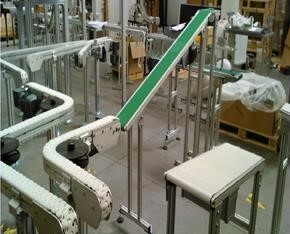 LVP fully integrated the new conveyor to existing systems and the result was excellent. A manual process replaced with an automated process and the inevitable savings associated with automating processes. The Belcon mini series comprises of compact and easy to carry mini belt conveyors. 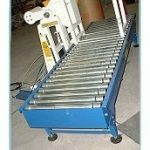 The series is ideal for conveying between processes and can also be used in an assembly line as a feeder or as an optional conveyor for mechanical equipment. LVP Conveyor Systems Ltd., the principle suppliers of conveyors and automated systems in Ireland have been automating processes for companies for over 20 years. The high concentration of Pharmaceutical companies in Ireland has meant that LVP have had the opportunity to provide leading edge conveying solutions for this high tech industry sector. The most recent achievement within the sector was for FMC International in Little Island, Co. Cork, a bulk pharmaceutical site. FMC approached LVP to provide a system that would allow for automation in the manual filling of large drums of powder. The system needed to be installed on the powder filling line and allow for the drums to be erected to 180 degrees to remove any foreign bodies. LVP provided a Powered Roller Conveyor System, which allowed the drums to be accumulated and separated by pneumatic blade stops, and filled manually before being palletized. The conveyor system transported the empty and full drums to an automatic palletisers which cut out any manual handling of the product. The systems significantly speeded up the processes and cut out any man handling of the product. This had positive implications for health and safety issues associated with manual lifting of weights. Production time was increased and FMC were very satisfied with the benefits the new system brought to the production line. Busy times in LVP Conveyor Systems! 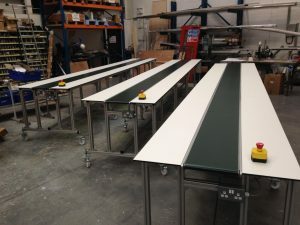 Recently we built these Okura Belcon mini guided belt conveyors (BMG) with assembly work stations for a UK pharmaceutical company. The conveyors measuring 6 meters long x 300mm wide incorporated a hard wearing plastic FDA work bench the full length of the conveyors each side of the belt. The work benches allow workers to manually pack pharmaceutical products and then pass them onto the conveyor allowing a seamless product flow through the production area. Full design specification and CE marking was carried out by LVP, as well as control panel builds. Special builds incorporating standard Okura products like these are our specialty; get in touch to find out more!